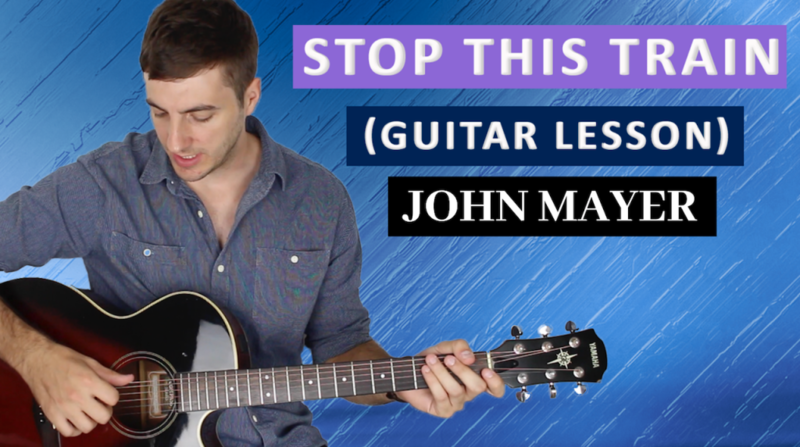 Scroll down for full fingerstyle guitar lesson (with tab/video tutorial) of Stop This Train by John Mayer. Stop This Train was written by singer-songerwriter and guitarist John Mayer in the mid 2000s, it appears on his hugely successful album 'Continuum' and was released 12th September 2006. It's a song we can all relate to and predominantly it's the lyrics that affect us the most, at some point we all feel somewhat lost and afraid of growing older. Stop This Train is no. 41 on my Top 60 Fingerpicking Songs of ALL TIME list. If you've not seen the list be sure to check it out and sign up to my weekly email lesson. That way you won't miss learning any of these great fingerstyle songs. As well as the beautiful words to Stop This Train the acoustic guitar is also wonderfully constructed. It isn't an easy song to play and the tricky right hand technique will likely take some real work to get comfortable. John employs a percussive tap on the bass strings on beats two and four throughout the song, and at the same time as these taps he plucks other strings down with the nail of his index finger. If you've never done this before you will almost certainly find it incredibly uncomfortable and hard to get accurate at first. For that reason I strongly recommend practising and mastering this technique before moving on to learn the rest of the song. As mentioned above, the hardest part about the song is the picking technique, so I recommend learning the right hand pattern first and practising it over and over again until you can play it well. As always, focus on accuracy over speed. For the verse of Stop This Train you'll need to have pretty large hands to play the chords that John does. You have to stretch your fingers from the 3rd fret on the low E string to the 7th on the high e. If you can't quite make it then you could just play a G chord for the four bars. There's a lot going on in the chorus of Stop This Train, with many small nuances to apply. Virtually everybody plays this song slightly differently, so please don't get too caught up and meticulous about playing every note exactly the same way I have. Just before going into the third chorus there's a quick four-bar bridge. This shouldn't be too tricky to play if you've got the picking pattern down, as you just use that pattern right through the progression. Heading towards the end of Stop This Train we have another bridge to deal with.